1. Top of the List- Rejuvacote, Best Selling Nail Growth System from Duri. Made in USA. Created for split, weak, cracked, thin and acrylic eaten nails. Apply as a base coat, in a matter of weeks you will enjoy the look and feel of strong vital, natural longer nails. As your nails improve, can be applied every other day for maintenance. 2. Nailtiques- The unique formulations provide complete nourishment that promotes and maintains a healthy foundation for long strong nails. This is therapeutic care for nails specially formulated for your specific nail type and needs. Company is based in Florida and since 1990, Nailtiques has been providing therapeutic nail treatments that surpass all others. Nailtiques nail care system treats multiple nail problems, while supplying nourishment to strengthen nails, they also eliminate peeling. Formula 1: Maintenance for Healthy, Flexible Nails. The salon-tested formulations offer special combinations of ingredients, including hydrolyzed keratin and protein in combination with gelatin and calcium to build a healthy nail foundation. The protein formulas bond the nail layers together building a strong nail foundation resistant to peeling, chipping and splitting. Formula 2: Treatment for Soft, Peeling, Bitten, Weak or Thin Nails. Nails that are soft, peeling, split or just will not grow will see marked improvement when treated with Formula 2. This formula consists of a unique blend of protein and conditioners. Formula 3: Care for Naturally Dry, Hard Nails. Formula 2PLUS: Treatment for Excessive, Problem Nails. 3. Nail Tek- Another high quality professional treatment for soft peeling nails. For those who prefer natural products, All NAIL TEK products are DBP and Toluene FREE. Foundation Formula II is a unique base coat with a special blend of strengtheners, conditioners, micro-fibers, and natural fillers, creating a superior surface that greatly increases polish adherence for a long-lasting manicure. Soothes uneven nail surfaces and masks nail imperfections for healthy, beautiful nails. 4.Essie Protein Base Coat-Contains wheat protein which strengthens, protects and promotes elasticity for nails. This base coat will also leave a smooth finish and extend the duration of nail polish. 5. Seche Plus Fortified Strengthener from SecheVite- is an innovative treatment for strengthening and hardening weak, thin, split and brittle nails. Seche Plus™ can be worn alone or as a base coat. Dries clear, hard and has a long lasting finish. 6.China Glaze Calcium Gel Fortifier - Contains Vitamin B3, Panthenol and Calcium, thick gel coating for substantial protection for weak, dry, splitting nails. DBP, Toluene & Formaldehyde Free. 8. 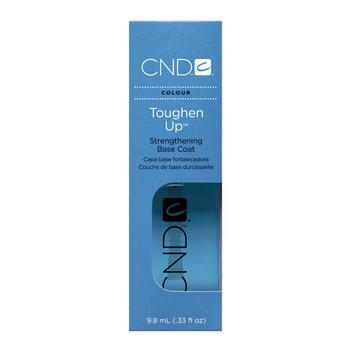 CND (Creative Nail Design) Toughen Up Strengthener Base Coat- Cross-links keratin in the natural nail. Safer alternative than formaldehyde, as it does not cause allergic reactions and will not excessively cross-link keratin, which can lead to nail brittleness. Strengthens natural nails. Improves nail Colour wearability.Helps prevent surface staining of natural nails. 3-free formula does not contain Formaldehyde,Toluene or Dibutyl Phthalate (DBP). 9. Nail Optimizer from Olan Laboratories- Protein Treatment, contains calcium, keratin, and natural proteins to nourish and strengthen nails naturally. When used regularly, Nail Optimizer makes a stronger, peel and chip resistant nail. 10. Optimax Nail Strengthner from Olan Laboratories- new product, formulated for hard-to-strengthen nails as well as soft thin, splitting, peeling nails. Optimax`s exclusive formula contains proteins to help strengthen the nail along with a special natural ingredient from central Africa called Okoume A.E.